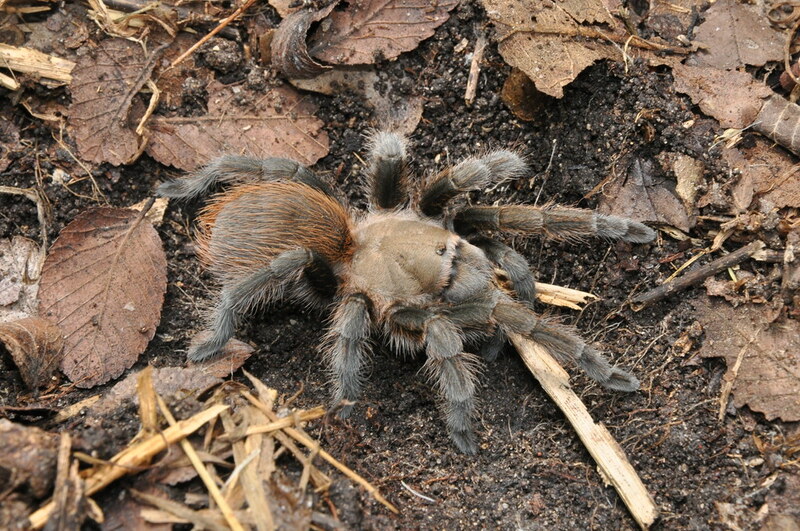 There are several kinds of tarantulas that people commonly have as pets; within the wide range of species, one of the most common is the Aphonopelma hentzi, known as the Texas brown tarantula as they can be found in that region of the United States. These tarantulas are commonly found on the south of the US. Their color patterns can vary from various shades of dark brown, and it can change once they’re done molting their skin. The bite of this tarantula isn’t really dangerous to humans (unless you are allergic to them, of course), and their behavior isn’t really aggressive, making them one of the easiest kind of tarantula to handle. They’re capable of throwing urticating hairs from their abdomen if they feel threatened by something. As mentioned above, these tarantulas are commonly found in the southern region of the United States, and there have been some specimens found in the north of Mexico, around the Texan border. They’re mid-sized; as adults, a size of 14 or 15cm is common in females, and the males are a bit tinier, with a size that can vary from 12 to 14cm. If you’re thinking of getting a new kind of pet and have some kind of tarantula in mind, this one could be the one that suits you best since they’re very easy to manipulate! The lifespan of the Texas brown tarantula is different in both females and males, as usual. Females can live longer, with a lifespan of up to 36 years (although there have been specimens known to extend their life to 40 years!) and the males up to 12 years. Their color combination can vary from soft shades of brown to darker ones, especially in the zones in which they grow urticating hairs. They can expand their legs from 10 up to 12cms, depending on their size. The fact that they’re mid-sized tarantulas and a non-aggressive kind makes them one of the best options to have as pets. We’re talking about a very docile species, you won’t have too much trouble handling them so you can expect to be very good friends with them in little time. They do not require too much space. Despite their calm nature, they’re usually discarded as options for pets. If this is your first time having a tarantula as a pet, this one will be a very good option for you! Handling an. A. hentzi isn’t really that difficult. Since they’re usually friendly, you can easily make the tarantula walk through your hand if you place in their front. Sometimes, when feeling in danger, they will rise up their front legs to let you know that they don’t feel comfortable. When something like that happens, you should be careful, as they are capable of throwing urticating hairs from their abdomen – which doesn’t happen very often; they usually will only walk away from you and hide somewhere in the cage. Their bite isn’t really dangerous, as mentioned above, unless you’re allergic. However, as with any living being, you may encounter some of them who have an attitude; to prevent accidents, you should be careful while handling your tarantula to avoid any bad reaction. Their feeding consists of crickets and cockroaches, but you can feed them with other kinds of insects once in a while, such as, for example, grasshoppers. They’re usually not picky about their food, but the first two options are more accessible, so you shouldn’t have any problems with it. This is a kind of tarantula that likes to dig; one of the most common places where they are found is underground, so the cage that you choose for them should be able to mimic their natural habitat so they can feel like they’re in home. As told earlier, they do not require too much space, so the cage doesn’t have to be that big. You can find a good cage for them anywhere, but make sure that they will suit the size of your tarantula. As common with this kind of animal, you should change their cage once they’re adults (if you have bought a young specimen, you usually know that they’re adults when they first change their mold). An ideal cage size for an adult would be of 30x30x25 or 30cm. They’re usually hidden in the floor of the cage, but you should set up a proper temperature around their cage so they can feel comfortable; a temperature of 25 or 26°C should be enough for them during the day, and you should adjust it to 22°C when the sun goes down. The humidity of the cage should be of around 60% and 65%. You must provide enough water to your tarantula. Males suffer a drastic change when they reach the maturity; after molting, their colors change from soft tones to darker ones and their legs become larger. It’s very common for the males to die after the copulation is done. When they’re done with the process, you can expect an egg sac from the female during the next three or four months; usually, the tarantula will have around 200/300 babies after about three months. While in captivity, the reproduction happens very rarely (to avoid saying never), the specimens usually catch in the wild are already fertilized and ready to bring some new spiderlings to the world. They are usually not aggressive, so if you’re curious, you can try to pick them up when you want without worrying about bites. However, as already told, you should be aware of the tarantula’s movements. They will raise their front legs once they feel uncomfortable or in danger; they can throw urticating hairs, but most of the time, they will walk away and hide. If you notice something like that, it’s better not to bother them. Their feeding isn’t that complicated, and since they’re not picky about their food, you can get creative and give them something different once in a while. If you notice a strange behavior on your tarantula, this might be due to them feeling uncomfortable with the current cage. Sometimes, if they don’t like their current environment, they will stop eating or will not move from too much around the place (to mention a few things, every animal is different, and you can’t predict their behavior). You can fix it by getting a new cage or just adjusting things you think that might be the problem, such as, for example, the depth or the temperature. Don’t let the bad things about them discourage you from getting a new one; unlike many animals, they won’t make any type of noise and will not consume too much space in your house. If you try hard enough, we’re sure that you will find a new friend in one of these tarantulas!